Christ University, Bangalore has announced the admission dates for Christ University Law Entrance exam (CULEE) 2018. The University will conduct the written Exam on April 29, 2018. The e-window for submission of CULEE Application form has been opened from December 8, 2017. The candidates can submit the application Form until April 19, 2018. The Christ University law exam 2018 also known as CULEE 2018 is a university level exam on the basis of which students are granted admission in BA.LLB and BBA LLB integrated law courses. It is to be advised that the candidates should check the CULEE eligibility criteria 2018 before filling the Application Form. As per the Eligibility Criteria of CULEE 2018, candidates should have passed 10+2 examination from any state board or any other recognized educational board, securing at least 45 per cent of marks in aggregate of all the subjects in the qualifying examination. Below table consists of all important dates related to the Christ University Law Entrance Exam. 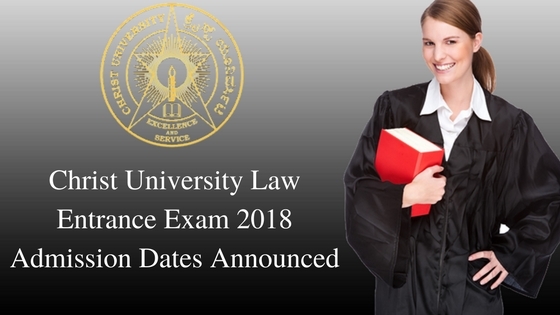 Candidates should note the important dates for the 2018 edition of the law entrance exam being conducted by the Christ University, school of law. The exam is an offline exam unlike CLAT and other law entrance exams. This means it is a pen and paper exam which will be conducted on assigned centers. Also, CULEE Exam is a MCQ based objective paper. Total questions in the paper are 120 which are to be solved in 120 minutes. That brings us to an end of all basic information about the CULEE 2018 exam and relevant important dates. Good luck preparing! The latest CULEE 2018 Notification has been released, check the CULEE Admission dates and other important exam dates here.